One of the smallest counterfeit detectors in its class, the EuroSure is compact, ergonomic and easy to use. Ideal for busy retail areas, the EuroSure’s small footprint makes it easy to accommodate, even on a cluttered counter. It features two pop out struts that can be used to elevate the entry slot to a more comfortable angle for users. It can also be wall-mounted for maximum convenience. Easy to use, the EuroSure features a bright, clear LCD display which shows the value of the note passed through the machine or a warning message when a counterfeit note is detected. The orientation of the display can be changed depending on whether the unit is placed on a counter or on a wall. 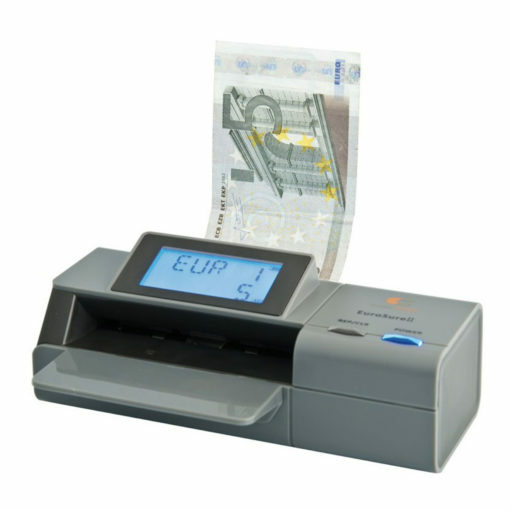 Certified by the European Central Bank, the EuroSure features infra-red and magnetic thread/strip detection, as well as size/format recognition for all current Euro banknotes. 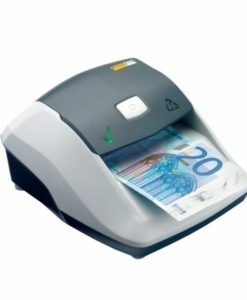 It includes a USB port which allows the unit to be updated for new banknotes, meaning the EuroSure is completely future-proof. A rechargeable battery is included, allowing the unit to be used without the need to plug it in. This is ideal for outdoor events and is also helpful at reducing unnecessary cabling and clutter from a workplace. The battery can be charged via USB or via the included mains adapter. The EuroSure can also be operated off the mains if preferred.